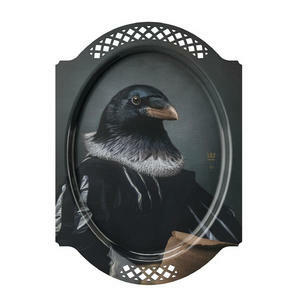 Combining the mystery and romance of a renaissance portrait with great French design to produce uniquely beautiful homewares. The rich colours, decorative fretwork edging and enigmatic images translate effortlessly from serving tray to wall-hung art. Le Corbeau and his counterparts Le Singe & Le Renard are inspired by the court of Versailles where the characters live in the shadow of the king's splendour. Made of waterproof and heat resistant laminate material and supplied in an equally stylish gift box. Other ibride portraits available - collect them all.